After nearly failing his PSLE, Benjamin started out as an underachiever, scoring D’s and E’s for Mathematics while in Normal Academic stream. After adopting effective learning strategies, his teacher saw a drastic improvement in his results and offered him Additional Mathematics. From that day onwards, he went on to top the school in both subjects, eventually scoring 8 points for his ‘O’ Levels. Benjamin also represented his school at the Mathematics Olympiad. In college, he was offered Further- Mathematics (FM), Mathematics-C (MC) and Special Papers. Likewise he became the top 1% of his college in Mathematics. Thousands of students have benefited from Benjamin and his team of specialized trainers’ teachings, with vastly improved results to show. Our belief is that students get poor grades not because they are stupid or slow, but because they just lack an effective strategy, a lack of clear goals and role models. 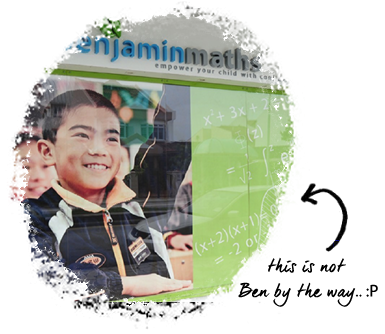 At Benjamin Maths, we provide you with the role models and effective strategies.